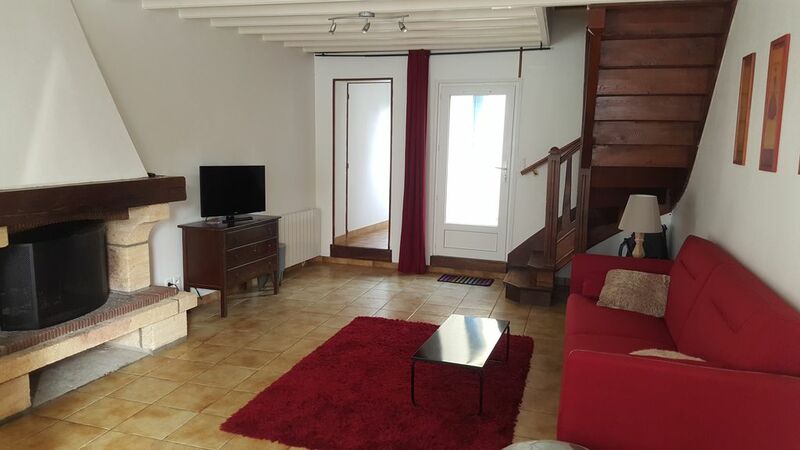 Charming stone house in the village with large garden and fully enclosed. Barbecue, garden furniture and sun loungers available. Jonville Beach facing south, 800 meters. You can cycle there by bike path. Possibility of loan of bicycles. For the little ones, cot, bath and high chair available. Lovely little cottage in a lovely sleepy village near the coast of Normandy. The cottage is clean and basic but with all the facilities you need for a comfortable holiday. The garden area is fantastic with a lovely lawned area but also a built in bbq and sitting area. We had fabulous weather so could enjoy the sunshine using the garden recliners provided. There was also excellent storage space for our bikes. Make sure you check if you will be provided with bedding and towels as we initially had neither when we arrived. Ideal for touring the area, we particularly loved the bar at Jonville beach which was great for relaxing with a drink and something to eat and also St Vaast is beautiful. Also easily travelled to Cherbourg and a bit further to Bayeux which was fabulous. The local beaches are beautiful and quiet. Anthony and his wife met us when we arrived and were very helpful, although returning emails sometimes was slow. I would recommend this lovely little cottage. Cuisine très bien équipée en matériel il manque cependant une table avec des chaises dans la cuisine. Le séjour est un peu froid ,il mériterait une décoration plus moderne et plus chaude pour le rendre plus accueillant. Gite agréable et bien situé avec la boulangerie juste à coté ! Merci beaucoup, ce fut un plaisir de vous accueillir ! Alles Notwendige vorhanden. Sehr schöner und gepflegter Garten. Zuvorkommender Vermieter. Kein WLAN. Günstige Lage (Dorfmitte, Meer/Strand). We will be happy to welcome you for your stay in Val de Saire! Merci de prévoir un chèque de caution de 300 euros lors de votre arrivée.